I like mangoes. However, I don’t like trying to cut the pit out of a mango. More often than not, the juice from the mango makes my hands slippery and the mango shoots across the kitchen under the knife. Sometimes it flies onto the floor where I have to beat the dog and the three second rule if I want to save a spendy mango. That’s no way to treat a mango. As a result, I rarely buy fresh mangoes. The Balancing Act offered me an opportunity to try Sol Bliss frozen fruit purees. A fruit puree would solve my flying mango problem but I was skeptical. Some fruit gels and purees have added sugar, syrups, or are a color that is not found in nature. I mean, what’s the point of serving fruit if it’s covered in extra junk I don’t want my family to eat which is why I’m giving them fruit in the first place? My research found that Sol Bliss has one ingredient – fruit. That’s it. No extra sugars or junk. Just fruit. I can live with that. Not only can I live with it, I decided to cook with it. Sol Bliss and The Balancing Act suggested Sol Bliss Fruit Purees taste great in smoothies, mixed in yogurt, or made into popsicles. I’m sure they do. I had something else in mind. My Mango Pork Chops recipe is loosely based on the first dinner I cooked for my Husband when we were dating. Apparently, the combination of fruit and meat in a dish kept him coming back for more. More food you sillies. That dinner was the start to our beautiful foodie relationship. If you do not eat pork, you can substitute skinless chicken for pork chops. 1. In a small bowl combine the package of Sol Bliss Mango Fruit Puree, ground allspice, cinnamon, salt, and pepper. 2. Drizzle olive oil to coat the surface of a frying pan. Turn the burner on and set to low to medium heat. 3. 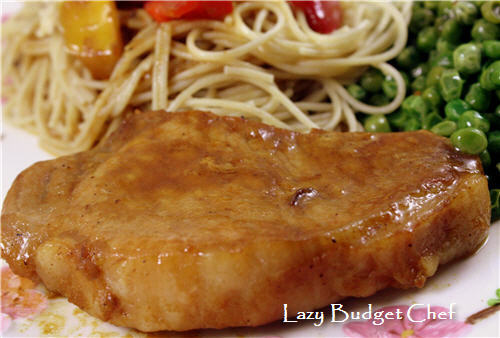 Place the pork chops into the frying pan. 4. Pour the mango mixture over the pork chops in the frying pan. 5. Add the chopped bell peppers to the frying pan. 6. Sauté both sides of the pork chops in the mango mixture until done. 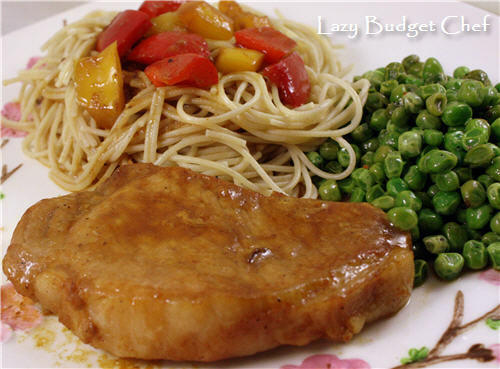 I served the mango pork chops with peas and whole wheat angel hair pasta on the side. I topped the pasta with the sautéed bell pepper and mango mixture to keep things interesting on the pasta front. This dish is an easy, tasty, and a great way to impress a dinner guest! Did you like this post? Get more like it by subscribing to the Lazy Budget Chef RSS feed or by subscribing to Lazy Budget Chef by email. Mango and pork chops...great combo! thanks for linking at the Stinky Linky party! I bet these have a great stink about them don't they! Hi Lisa! Oh, this looks delicious! I love pork chops and I love mango so this is really a winner. Letting you know you this recipe was featured on the Stinky Linky party tonight! Congrats!